Following an announcement by BEIS on what government have done since the publication of the Helm Review, join us to hear from BEIS themselves on current policy thinking around the Cost of Energy. 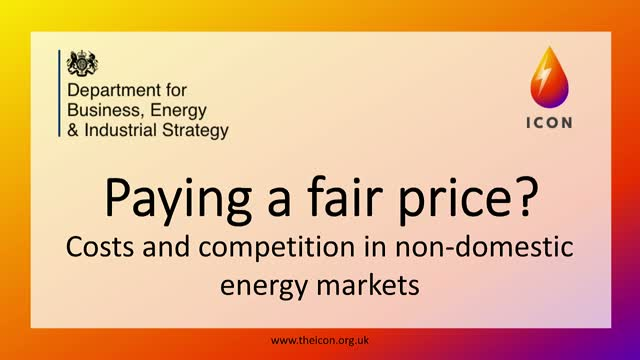 What is government doing to tackle energy costs in the non-domestic sector? Are we really supporting British business, when rising costs of production impacts our global competitiveness? Most of the cost rises are coming from non-commodity charges. Is this an essential spend, delivering critical infrastructure with the costs applied fairly to all users, or are the networks reaping benefits at the expense of the consumer? And how can we ensure we get the best price when we go to market? Government recognises that the increase in delivered electricity prices caused through the recovery of environmental levies on industrial energy consumers’ bills threatens to reduce the competitiveness of UK businesses in international markets. This particularly impacts our most energy intensive industries. To address this, a new exemption scheme from April 2018 provides relief to industries whose global competitiveness is most at risk. Eligible businesses may apply for a partial exemption from the costs of funding the Contracts for Difference and Renewables Obligation. Successful applicants are also, automatically, eligible for relief from Feed-In-Tariff costs. Government has recently consulted on widening the scheme - how do we strike the balance between supporting British industry and avoiding a heavy financial burden on those who are not eligible for the exemptions? And how does this tie into policy making for Brexit, British exports and the wider Industrial Strategy? Join our webinar to hear directly from Arjan Geveke, the Associate Director of Energy Policy (Productivity Team) at the Department for Business, Energy and Industrial Strategy as he outlines government's understanding of what industrial energy consumers need and how the policymakers plan to support these sectors. With response from NSG Pilkington - a major glass manufacturer affected by these issues and insight on market trends and consumer activity from Inspired Energy, this promises to be a lively and highly informative discussion. icon is all about making life easier for energy and estates managers. We protect large energy consumers from unpleasant surprises by keeping them updated with information on policy and regulatory changes including non-commodity cost forecasts. We help improve operational efficiency by supporting decision makers through our knowledge hub and network of specialist partners whilst our easy-use compliance tools let you quickly identify what needs to be done and avoid the risk of breaching environmental legislation. All our content is made accessible and engaging without losing any of the important detail you need to make good decisions and plan your future business strategy. Subscribe to this channel for a steady stream of relevant and timely content, designed with energy and estates managers in mind.